Just what will it take to have the Central Bank of Ireland investigate interest swaps mis-selling? Ireland is not Britain, we do things differently here. Sometimes better, like early action on smoking in public places and taxing plastic carrier bags, but often worse, particularly in the area of financial regulation. For those of you with routine access to British media, you are likely to have at least, heard the term “mis-selling” and you might recall hearing the term “PPI” which stands for Payment Protection Insurance, which is a form of insurance sold by banks to consumers alongside loans in case you run into difficulties with repaying the loan eg through redundancy. Trouble was, that many of these insurance policies were either inappropriate or useless because for example they were sold to people who did contract work and contract work was excluded from the PPI redundancy provisions, or consumers were strong-armed into taking out the insurance or presented with the insurance as part-and-parcel of the loan. Despite the scandal and full magnitude of PPI mis-selling being uncovered in the UK in 2009, it was only in February 2012 that our own Central Bank took steps to investigate if we had similar problems here. And surprise, surprise! it seems we have, and banks and other firms supplying PPI are now being investigated by the Bank which has demanded firms examine their sales of PPI for the past six years to identify mis-selling. This is is likely to be an early step which may see hundreds of millions of euros refunded to Irish consumers. In the UK, over €2bn has so far been refunded to consumers through the Financial Services Authority. More recently, you might have heard the term “mis-selling swaps” but for most people, this will have sounded very technical and because it just applies to business lending, it is likely to have been ignored by most people. However the sums of money being reported in Britain for potential compensation may have registered with you – there is talk of billions of euro, and only this week, just one bank alone, HSBC made a provision in its accounts for €200m (USD 240m) for potential claims. 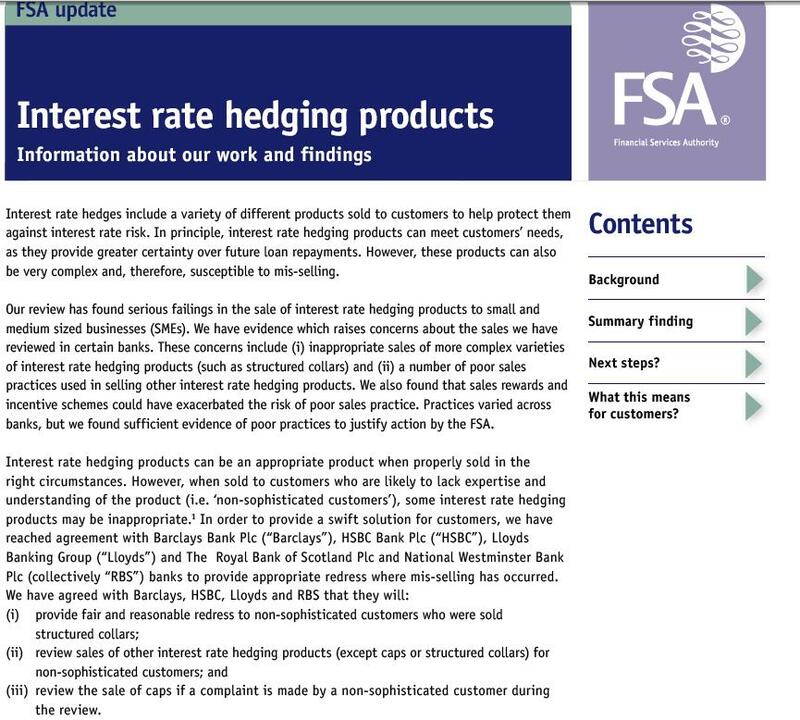 The UK’s Financial Services Authority, the FSA has taken a lead-role in dealing with the issue – above are extracts from its review of British banks. And last week we learned that AIB and Bank of Ireland now form part of that review, but only for their UK operations. And just last week, the issue made a dramatic entrance onto the Irish stage when it was reported that NAMA developer, David Agar had reached a €30m settlement with Ulster Bank following a case he had taken in Dublin’s High Court. 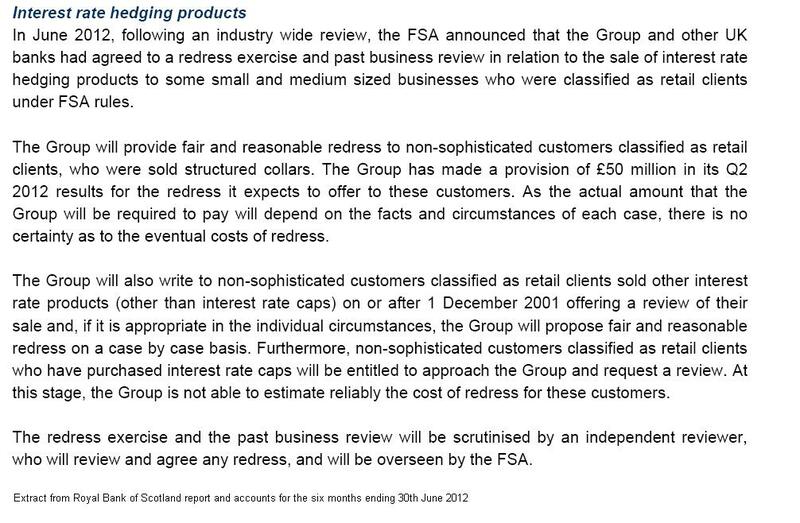 Below is the extract from the RBS – Ulster Bank’s parent company – half yearly accounts published today. It seems the GBP 50m provision mightn’t be enough, if just one borrower on one loan has won GBP 25m! What are swaps? They’re a misnomer for a start, that’s what they are! Because what the media refers to as “swaps” – based on the notion that one borrower who wants to protect against interest rate rises “swaps” the risk with a depositor who wants to protect against interest rate falls – should really be referred to as “interest rate hedging products” – note it’s not an ACRONYM like the South West African Peoples Organisation!. In fact these hedging products included all sorts of varieties with exotic names like caps, collars, structured collars. They’re a form of insurance taken out by business borrowers to protect themselves against interest rate rises. Unlike the personal loan you might get from the bank, or the fixed rate mortgage, business lending is generally tied to a specific interest rate. Much like tracker mortgages are tied to say, the main ECB interest rate. And business borrowers routinely took out insurance in case the interest rates increased. The mis-selling of swaps occurred in the UK for a variety of reasons but they included making the approval of the loan conditional on taking out a swap arrangement, or swaps being for periods longer than the loan term – who needs interest rate insurance for 10 years if the loan is supposed to be repaid in five?! – or the terms of certain complicated and potentially expensive swaps not being adequately explained to borrowers. And it seems there was quite an incentive for bankers to sell you an interest rate swap, they took the profit – and commission and bonus! – on the sale upfront, even if the swap term was for years. 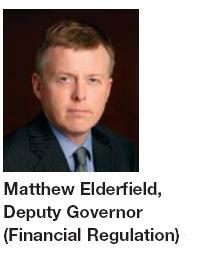 There is one person in this country who should be shouting about this issue from the rooftops, and that is our Financial Regulator, Matthew Elderfield (pictured below) . Although Ireland and Britain may have different banking systems, banking practices tend to be similar – and our British Financial Regulator knows this more than most – and separately, “Irish” banks like AIB, Bank of Ireland and Anglo are, and have been, very active in Britain. So our Financial Regulator should be voicing concerns about the possibility – at the very least – of Irish banks, or banks operating in Ireland, mis-selling and interest-rate swaps. But there is another man, however, who needs these issues appearing in national discourse, like he needs a hole in the head. 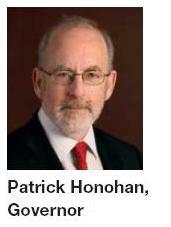 And that is the Financial Regulator’s boss, Governor of the Central Bank of Ireland, Professor Patrick Honohan (pictured below). We recently witnessed Governor Honohan apparently getting very flustered at the prospect of the new Personal Insolvency Bill conferring what might be expensive new rights on borrowers particularly in respect of secured lending – the Governor understands more than most that in the see-saw of power between borrowers and lenders that lenders might need find new capital should the powers of borrowers be excessively boosted. And if 50 cases like David Agar’s emerge – and remember his case apparently related to a single loan on a single office building in Dublin – then that could be another €1.5bn of capital needed by the banks. So it might be safe to assume that Governor Honohan does not want to see billions of euros of claims against an Irish banking system which is just out of the Intensive Care Unit but is still in critical condition. It would be a shame however to see the Governor held hostage to fortune as the man seen as responsible for last year’s stress tests – yes it was BlackRock, the Boston Consulting Group and Barclays Capital that did much of the work, but it was closely overseen and managed by the Central Bank. The shame would be if the figures in last year’s stress tests were given priority over the probity of banker’s actions towards their customers. And on the other side of the see-saw, you have business borrowers and what about the injustice done to them – be they bread-and-butter Small and Medium Enterprises (SMEs) or property developers – who were strong-armed into buying swaps even if they were unwanted, inappropriate or in some cases, downright useless? The issue of Payment Protection Insurance was raised in the Dail last month by the Fianna Fail finance spokesperson Michael McGrath who asked the Minister for Finance Michael Noonan “the position regarding the Central Bank of Ireland investigations into possible mis-selling of payment protection insurance by regulated entities; if he will confirm the scale of the problem; and when the investigation is due to be completed.” and he was told “the Bank has identified a number of concerns. The inspection was carried out in order to determine compliance with the provisions of the 2006 Consumer Protection Code, now revised since 1 January 2012. As a result of the inspection, the Central Bank is requiring the seven firms inspected to conduct a comprehensive review of all of their PPI sales from August 2007 to date. 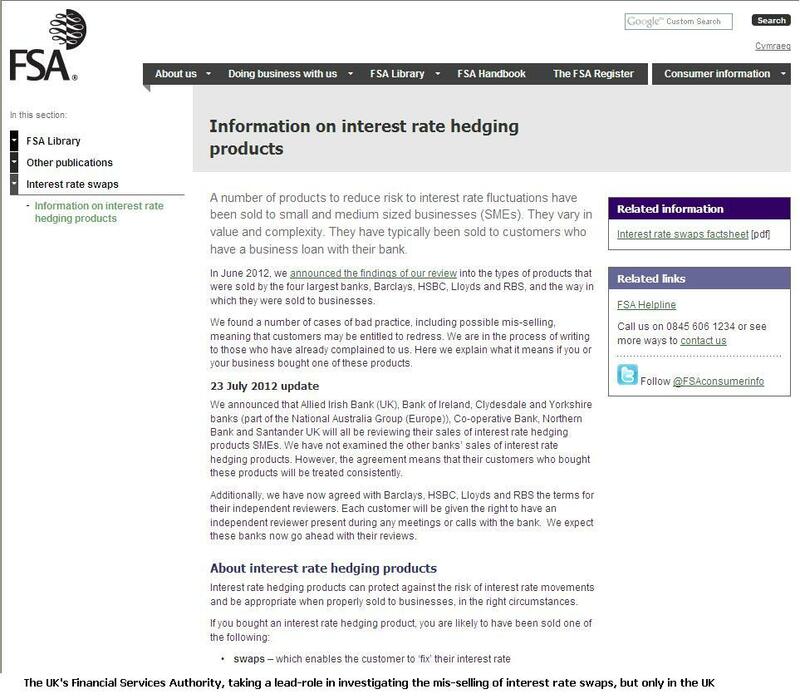 The firms are requested to respond to the Central Bank by 17 August 2012” So we may soon see if consumers will be in line for payouts for being mis-sold PPI. How long before the Central Bank investigates mis-selling of interest rate swaps? And by the time it does investigate the issue, might the Statue of Limitations which generally is six years for contract-related matters, mean that even if rank injustice has been done to borrowers, that they have no redress? This issue appears not to have been identified by the politicians yet as being a significant problem, but after the David Agar settlement last week, how long before it is. A quick canvass of the Opposition reveals that complaints by businesses about interest rate swap mis-selling have not yet become an issue, but all have said the issue will be monitored. The Sinn Fein party economics advisor Joanne Spain was willing to go on the record and said “Principally speaking – regardless of the impact on banks’ balance sheets, even banks we own – if such an event has occurred in this state, we would want to see the financial regulator investigate it. Trust in the banking industry, the regulator and the political system has been so badly breached that the only way we can move forward as a state is to have full transparency. And ultimately if borrowers are found to have been mis-sold a product, they are entitled to compensation, whether this compensation comes from the banks or the state because of natioanlised banks. If the government applies one logic to creditors of banks- ie bondholders – it cannot apply another to wrongfully treated customers” And for the time being, at least, the Central Bank seems to see the issue as one to be resolved between borrower and lender, and doesn’t necessitate its intervention. Yet. Were semi states and other government funded groups with autonomous budgets buying swaps etc. too? Maybe pressure from these groups first (as in earlier comment about Oakland Ca council taking on Goldmans) is needed. For example the department of education taking on a bank to renegotiate swaps so it could build a classroom would resonate more than some peeved rich guy taking on a bank. It goes deeper than mis-selling when a product destroys the customer. The product was sold then, but this is now. A lot has changed. A lot that would appear not to be written in stone.